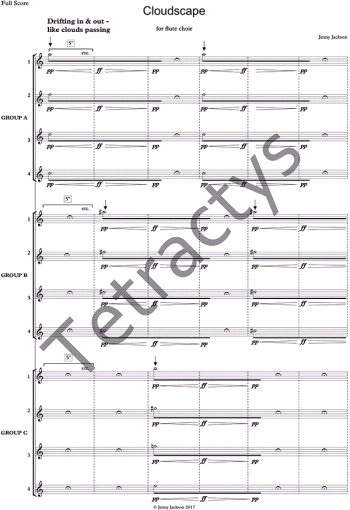 I’m pleased to share the news that Cloudscape (2017) for flute choir has been published by Tetractys. Available for 12 C flutes or alto flutes. Originally commissioned by Sheffield Flute Choir and performed by them at the Classical Sheffield festival 2017. Coming soon: I’m so excited to hear my new piece Mimesis for piano and percussion which has been composed for the Passepartout Duo following a fruitful period of collaboration. Before I met them, I watched some videos on their website which I found to be entertaining, innovative and visually intriguing. I have tried to compose something that will be equally theatrical and musically engaging. Do you enjoy listening to new music? Fancy having a go composing? 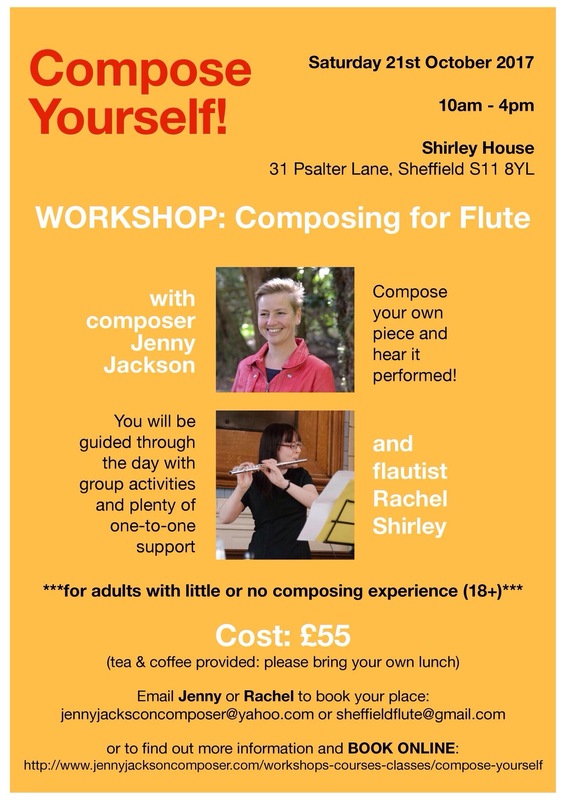 I’m running this one-day composing workshop in October with flautist Rachel Shirley. Interested? The workshop is ideal for adult musicians (18+) with little or no composing experience who want to ‘have a go’ in a relaxed and friendly atmosphere. They do not have to be proficient on any instrument as Rachel will perform the music. The day will consist of group activities and individual writing time (with one-to-one support from both of us) with plenty of opportunities to hear outcomes and make revisions as your piece progresses (the best way to learn, and a real luxury!). You will be guided through the process of composing your own short piece for solo flute, culminating with an informal concert given by Rachel, which will be recorded so that you can have a copy. The course will be structured to mimic my own writing practice, starting with a simple line-drawing activity to generate shapes and gestures before developing your piece step-by-step. This will be done by considering the overall character of the piece and how it can be affected by pitch choice, tempo, articulation, dynamics and timbral colour. More traditional starting points such as key, time signature and meter will be put to one side as you are are encouraged to imagine, explore and discover. My new string quartet – Focus Pull – was premiered last week at the Music in the Round: Russia in the Round festival. It was performed by Ensemble 360 at the Crucible Studio, Sheffield. I’m really pleased with both performance and recording! Have a listen! Score and parts are available on request. We are the other side (just!) of a very successful Classical Weekend in Sheffield, which saw the premiere of my new mini-opera Madam Adam performed by Opera on Location, the second performance of my revised Hooting, not Drinking performed by Rachel Shirley (flute) & Platform 4 with members of Sheffield Flute Choir (blown bottles & flutes ensemble), and the premiere of Kraal for massed voices. Here are a couple of ‘action’ photos of Kraal…! Next up: Focus Pull for string quartet on May 8th 12.45 Crucible Theatre Studio, Sheffield (Ensemble 360), commissioned by Music in the Round for the 2017 May Festival: Russia in the Round. Sometimes, the only way forwards is to go backwards. In the case of my string quartet, ‘Focus Pull’ (commissioned for Music in the Round’s upcoming May festival), I knew that I wasn’t happy with it as it was (and it was way too long), so something drastic had to happen. Ripping it up doesn’t feel as disastrous/stupid/final as it used to when I wrote everything by hand (I must have at least twenty-five ‘versions’ of it on my computer to fall back on, for example) but it still feels like starting all over again because essentially you have admitted that, although it looks like a finished product, it really isn’t. I often do line drawings in the early stages of writing a piece to get ideas going: it allows me to work gesturally and expressively as I can quickly capture the essence of what my intentions are without worrying about the finer details. I like imagining the progression of sounds and often hear the instruments in my head as I draw, so that the results are instinctive rather than considered. In this instance, I produced shorthand representations of the types of textures I intended and, before I knew it, I had drawn out the whole quartet and created a distilled version of all the work I had done up to this point. Categories: Contemporary music, Contemporary string quartets | Permalink.